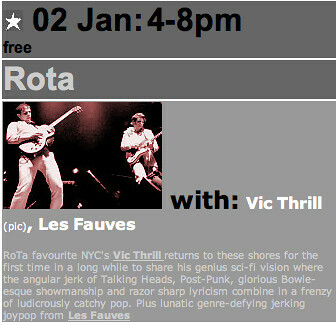 VT w/band @ Santos Party House 8/15 @ 8pm! TEAM SPIRIT ANIMAL SQUAD = LIVE 3D ANIMATION, to a soundscape of VIC THRILL music and indescribably beautiful backdrop of live video by www.BAMIAM.tv created and controlled live with the use of a keytar (those old 80's keyboards worn like a guitar). 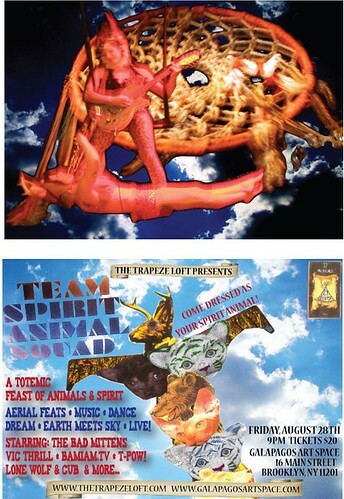 Each song is accompanied by stunning choreography of acrobats, dancers, trapeze artists and aerialists of various kinds - many from Tanya Gagné's Trapeze Loft (www.thetrapezeloft.com), hula hoopers, jugglers, a primitive naked man and strange fairy-like creatures manipulating the elements with their supernatural powers! 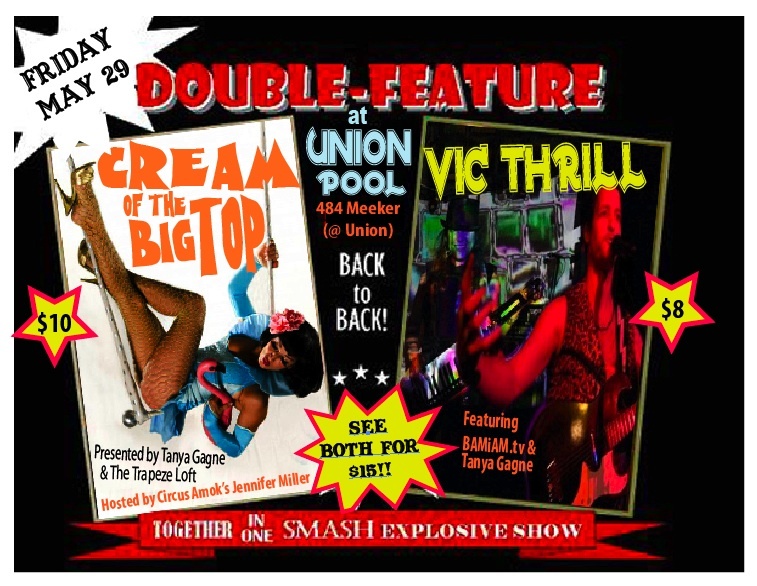 Performing live with VIC THRILL that night will be T-POW! 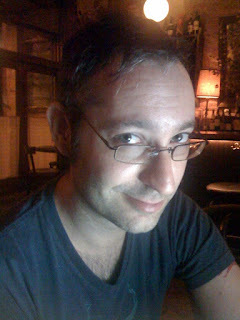 (www.wauwausisters.com) and the truly great Ryan Sawyer with the musicality of Buddy Rich and animal explosiveness of an orangutang pounding on a locked garbage can full of food! 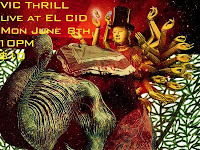 There will also be musical appearances from The Bad Mittens, Lone Wolf & Cub (http://www.myspace.com/ryanlonewolfsawyer) and cross pollination of all the musical acts throughout. There is no separation between stage and audience, the performance utilizes the entire space and brings the viewer in contact with the show in a very enjoyable and inoffensive way, almost as if you were snorkeling on a coral reef with schools of tropical fish swimming around you! You are encouraged to think of a spirit animal for yourself and dress as such for the show, as you really are a big part of it. Enjoy this amazing poster of the show by our favorite artist Joshua Siegel (www.bigvisual.net) as well as video taster taken from a still camera during the last performance. Last performance was also shot in detail by Chris Cassidy www.casspix.com, keep an eye out for his latest work and most recent TSAS coverage! This is gonna be a beach BLOWOUT!!! 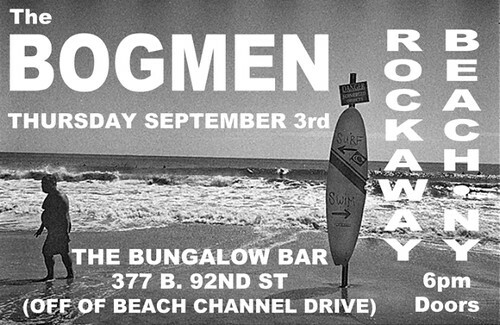 Outside, right on the water, facing sunset with Manhattan in the background, underneath the Cross Bay Bridge, the Bungalow Bar is Family, the drinks are great, this is a full-scale Bogmen concert, get your tickets NOW because it will SELL OUT! 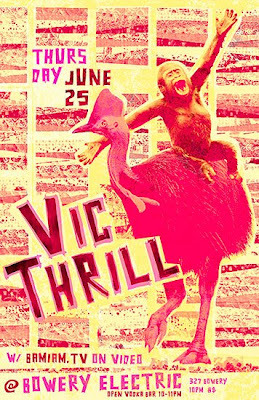 VIC THRILL in TEAM SPIRIT ANIMAL SQUAD @ GALAPAGOS w/band amazing live performers! 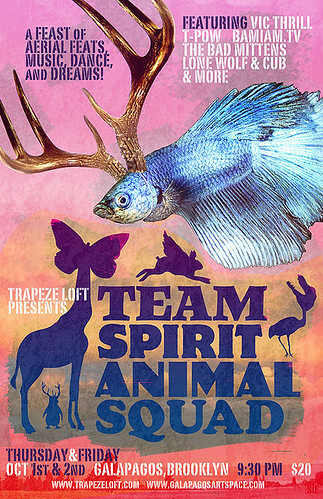 Fri 8/28 @ 9pm - VIC THRILL in TEAM SPIRIT ANIMAL SQUAD @ GALAPAGOS w/band amazing live performers! Team Spirit Animal Squad from BAMiAM on Vimeo. 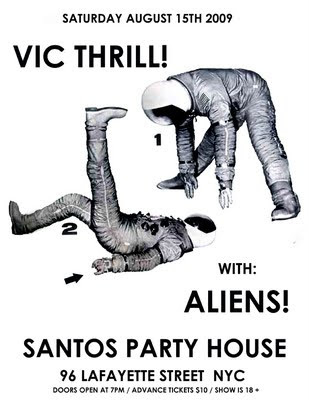 VIC THRILL w/full band TONIGHT @ Santos Party House! A Double-Feature Extra Sensory Assault by Air, Land and Sea!